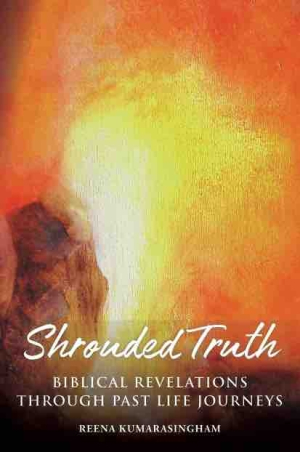 Shrouded Truth is an alternative, unexpected, and even shocking view of the life and times of Jesus. Reena Kumarasingham’s Shrouded Truth: Biblical Revelations through Past Life Journeys tells Jesus’s story from a most unusual perspective: that of eight individuals who underwent past-life regression. Unknown to each other, from different parts of the world, and possessing knowledge of biblical times that ranged from zero to in-depth, each of eight people (during therapy scheduled for entirely different reasons) spontaneously recalled events related to the life and times of Jesus. Subsequent sessions with them revealed surprisingly consistent stories that often differed from official church doctrine. Kumarasingham is an internationally respected therapist and certified trainer and supervisor for the Past Life Regression Academy. Her book is based on recordings from the sessions of anonymous subjects who, under deep hypnosis, recalled biblical-times experiences centered on the person of Jesus. The included stories have been evaluated for signs of authenticity or lack thereof, and the criteria used are given. The concerns of skeptics are addressed in the text, and the methodology for past-life regression is clearly described in an appendix. Historical references and a list of relevant writings by other authors are also supplied, giving support to the logical and credible suppositions and conclusions presented. The information presented diverges from church teachings. Assertions include that Jesus was one of several children, and that his father, Joseph, was not a carpenter, but a successful merchant. They claim that Jesus had three children with his wife Mary Magdalene, who was not a prostitute but Jesus’s chief apostle. Jesus’s ministry, here, is solely focused on love and equality. The sessions are presented in question-and-answer format. They clearly show that the eight were not supplied with leading information, making the similarity of their accounts all the more surprising. They use modern language; this is explained as a result of filtering memories through the conscious mind. The question-and-answer format makes for lively reading, keeping the narrative moving at a comfortable pace and calling forth the emotions experienced by the eight. Their responses are filled with vivid descriptions. The explanatory text surrounding the question-and-answer sections helps to clarify and contextualize the material. It addresses instances of seemingly contradictory information and supplies historical background. Such sections are conversational in tone; they add necessary depth to the material presented. Errors in grammar, syntax, word usage, punctuation, and spelling, as well as several instances of extra or missing words, mar the otherwise well-written text. Reincarnation is a touchy subject. Though early Christians, including popes, believed in it, most modern Christians do not. The book’s arguments around past-life recall are convincing and are supported by ample references, both historical and contemporary. Whether or not they are believed, the book provides much material for reflection and an opportunity to step beyond church dogma.